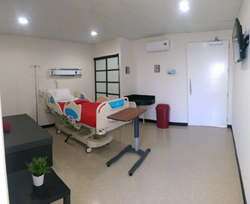 Tijuana Bariatric Center now has an entire hospital floor dedicated to weight loss surgery patients, allowing the practice to change more lives. The fourth floor of the hospital has its own waiting room, private patient rooms, nurse's station, and ICU dedicated to bariatric surgery procedures. The team at Tijuana Bariatric Center is pleased to announce that the entire fourth floor of the hospital in which it operates is now dedicated exclusively to bariatrics. Thanks to this recent expansion, the network of bariatric surgeons and weight loss specialists is now better able to serve patients who are looking for a solution to obesity and obesity-related illness. This means that the practice can help more patients who struggle with obesity and obesity-related health problems. The fourth floor of the hospital has its own waiting room, private patient rooms, nurse's station, and ICU dedicated to bariatric surgery procedures. While surgeries are performed in the operating rooms on the floor below, the fourth floor is dedicated to pre- and post-operative care. More patients can be treated thanks to added space for the practice. In addition to helping more patients, Tijuana Bariatric Center also offers a better post-operative experience for patients following their weight loss procedure. Bariatric surgery patients receive their own room on the fourth floor for overnight hospital stays. There is no need to share a room with a stranger, making recovery a more relaxed and comfortable experience. While the majority of the recovery rooms in the hospital are single rooms, there are double rooms that contain two single beds. Patients who have a loved one present can request these double rooms. Tijuana Bariatric Center can arrange special accommodation requests like this for the sake of convenience and greater peace of mind. If loved ones feel hungry, they can access the cafeteria on the first floor. Having the cafeteria on the first floor keeps the sounds and smells of food preparation out of range for bariatric patients, while keeping the cafeteria conveniently located for guests. Tijuana Bariatric Center uses the latest laparoscopic equipment to perform each procedure. This technology allows for advanced treatment through small, strategically placed abdominal incisions. This results in faster recovery times, reduced risk of complications, and smaller scars. Patients visiting from the United States will be pleased to know that the practice and hospital personnel speak fluent English. Nothing will be lost in translation during the treatment process, which allows patients and their loved ones to be fully informed of the surgical process as it unfolds. The high-quality care provided by the practice is a major reason why Tijuana Bariatric Center is popular for patients seeking affordable medical tourism. Patients from across the border can save money on major procedures without worrying about diminished safety or quality. For more information about the practice and how the network of doctors can help patients lose weight, contact Tijuana Bariatric Center. The practice can be reached directly using the contact information below. Originally posted by Tijuana Bariatric Center.